PIDG operates along the project life cycle and across the capital structure, to help projects overcome the financial, technical or environmental challenges, creating investment-ready, bankable infrastructure opportunities. PIDG delivers its pioneering infrastructure through three business lines that deploy a unique set of capabilities. Our reconfigured IFC-PIDG/TAF business will support the other PIDG businesses by providing support to project development and enabling transactions, improving the affordability and/or impact of projects through Viability Gap Funding (VGF), transaction advisory services, and piloting new programmatic initiatives. TAF plays a central role in enabling PIDG to initiate multi-company programmes and centrally-driven initiatives that are not specific to a particular company and that align with PIDG strategic objectives. DevCo provides advisory services to governments in the poorer (DAC I and II) countries to help them structure transactions that facilitate private sector participation in infrastructure projects. Select, customise and analyse development impact data from our Upstream Technical Assistance companies. InfraCo Asia provides responsible leadership in bridging the infrastructure gap in south and south-east Asia. 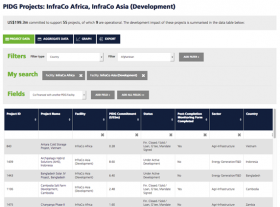 Through early stage project development capital and expertise, InfraCo Asia is a catalyst for the private sector to invest in sustainable infrastructure projects in south and south-east Asia. 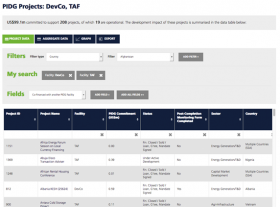 Select, customise and analyse development impact data from our Developer - Investor companies. PIDG’s Credit Solutions business will address a shortage of long-term, patient funding and a lack of local currency financing and local capital market development for private sector infrastructure projects in developing countries. They will provide funded and contingent hard currency and local currency credit solutions, with a focus on increasing local participation in both contingent and funded local currency financing solutions. EAIF provides long-term foreign currency loans in sub-Saharan Africa. GuarantCo provides innovative local currency contingent credit solutions, including guarantees to banks and bond investors to develop local capital markets. 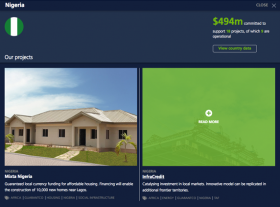 Select, customise and analyse development impact data from our Credit Solutions companies. PIDG operates in over 40 countries around the world. 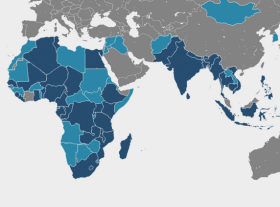 View our operations by region, country and sector. We operate at the frontier where other organisations cannot or will not yet go. We focus on frontier markets, with our focus predominantly on sub-Saharan Africa and south and south-east Asia.